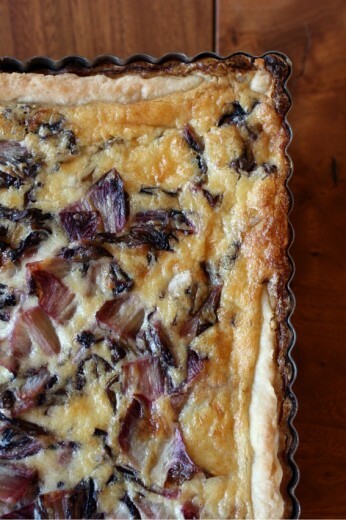 …you make a radicchio tart. Which I will tell you about in a moment. But first, yesterday was one of those days when the stars were in very strange alignment. One of those days when coincidence became kind of creepy. Not once but several times. One of those days when I should have bought a lottery ticket because, clearly, the universe was trying to tell me something. And, because I have approximately one million other things to do rather than tell you this story, I am going to tell you this story. This was my day. On the way out the door to take Graham to day camp, I saw my UPS guy. I waved. Walking Graham to the playground at camp, I started talking with another mom who was walking her daughter as well. I had never met her before but her name is Jill and she teaches music at my old high school. Kind of weird. Spencer and I ran errands, went to the wading pool, and then got frozen yogurt. As we walked in, we passed my UPS guy and while we were sitting and eating, Jill came in on her bike. Pretty weird. Then, last night, I taught a class. One of the participants was a guest at a wedding my brother was in over the weekend, and two of the participants were former yoga students of mine from a regular class I taught in 2003. They didn’t know it was me, their former yoga teacher, teaching the class, they came because one of their sisters-in-law recommended me. Really quite weird. Anyway, radicchio! We all get surprising things in our inboxes, right? A couple of weeks ago, I got an email from Emily at Royal Rose Radicchio. She was offering to send me some radicchio straight from their farm in California. Odd? A bit, yes. But I do like radicchio and don’t buy it all that often. It is terrific in salad for a little bitter bite and I love it grilled or roasted. That bitterness mellows and a wonderful sweetness emerges under heat. (My brother says it is great on a sandwich instead of lettuce. Good call.) So sure, I said, send me some of those gorgeous purpley-red heads of goodness. Late last week, a giant box appeared on my doorstep. Inside was no fewer than 20 heads of radicchio. Now, I do like it but 20 of anything is a lot to get through, especially if it is highly perishable. For the record, these were gorgeous specimens. Tight heads, not a blemish in sight, heavy for their size, more beautiful than any I have seen in the store. I gave some to the neighbors, gave some to the potluck people, roasted a bunch of it (it’s terrific on top of crostini topped with blue cheese and a bit of honey), and I made this tart. I am a member of a very cool book club – a foodie book club. Every book club I have ever been a part of has always been much more about the food and drink than about the book so I thought this was a brilliant idea. Each member contributes a dish from the book we read. This month we read a book of Julia Child’s letters and we had free reign to make one of her recipes from any of her books. I have my mom’s copy of Mastering the Art of French Cooking which, truthfully, I had never even opened until this week. With my plethora of radicchio, I figured it only made sense to try and use some of it. Radicchio is a member of the chicory family along with things like endive, escarole, and other bitter greens. I knew Julia wouldn’t have had access to radicchio in the 60′s but I knew, without even looking in the book, that there would be endive recipes. I road a bike through five different regions of France when I was 16 and we had homestays with families in each of those regions. I had endive, in various styles, in every single one of those homes. The French like their endive. 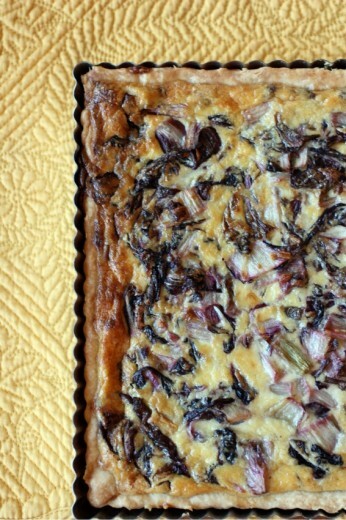 Mastering the Art of French Cooking boasts several endive recipes but as soon as I saw a tart, I knew that was the thing to make. 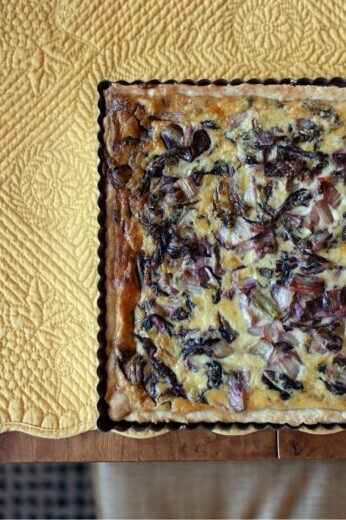 It does feel like sacrilege to change a Julia Child recipe but I made this my own by using my favorite tart dough, putting it in 9-inch square pan, and using a different chicory. I planned to use half milk and half cream for the filling but found I was out of milk, so all cream it was. One final note. I made this tart in a 9-inch square pan which looked very snazzy, I must say. It is a little tricky because not everyone gets a piece with crust. You can certainly make the recipe in a 9-inch round pan but if you have a 10-inch (or even an 11-inch), I would use one of those. Any way you slice it (ha!) you might not need all the filling and please resist the urge to overfill. If you do, the liquid goes over the sides of the crust and makes the crust soggy and the tart difficult to remove from the pan. Just to be safe, I always bake my tarts on a baking sheet to prevent any egg leakage on the floor of my oven. My plan was to use Gruyère cheese but I was out. I opted for Parmesan instead. Boil the radicchio over moderately high heat in a heavy-bottomed saucepan with the water, lemon juice, salt and butter until the liquid has almost evaporated. Lower the heat and stew gently for 20 to 30 minutes until the radicchio is very tender and has lost its brilliant color. Allow to cool slightly. Beat the eggs, cream, ¼ cup of the Parmesan, and seasonings in a mixing bowl to blend. Gradually stir in the radicchio. Check seasoning. Pour into the partially baked pastry shell. Sprinkle on the other ¼ cup of cheese. Bake in the middle of the oven for 25 to 30 minutes, or until puffed and browned. Blend flour, sugar, and salt in a food processor. Add butter; using on/off turns, process until coarse meal forms. Add 8 tablespoons ice water and cider vinegar; blend until moist clumps form, adding more ice water by the teaspoon if dough is dry. Gather dough together. Turn out onto work surface; divide dough in half. Form each half into ball and flatten into disk. Wrap disks separately in plastic and refrigerate 1 hour. (Can be made ahead. Keep dough refrigerated up to 2 days, or enclose in a resealable plastic bag and freeze up to 1 month. Thaw in the refrigerator overnight.) Soften slightly at room temperature before rolling out. For this tart, use half the dough. Roll out into a 13-inch circle or square. Transfer the dough to the tart pan and prick the bottom all over with a fork. Place in the freezer for 10 minutes. Remove from the freezer and line the pan with parchment paper or foil. Fill with pie weights or dried beans and bake for 10 minutes. Remove the weights and bake for another 10 minutes, or until the crust is still pale, but dried out and starting to turn just a bit brown. Proceed with the recipe. I like any tart, weird or not. a) I love it when life is super weird, like your weird day. Love the weird. b) this. looks. so. good. I need to sit down. ohhh yes apple cider. ok. i think i tried that once, long ago in a tart dough. thanks for reminding me i need to do it again. Wow that does sound like an eery crazy kind of a day! More and more I’m realizing how small of a world it is though! I’ve gotten better about liking radicchio but it usually seems a bit too bitter for me. This tart, with it’s creamy cheesy filling, sounds like the perfect way to cut that! What a gorgeous tart! Also loved hearing about your day. It does feel odd when you run into the same people twice in one day, but especially someone you just met! I do get a kick out of stuff like that. I love radicchio and would have welcomed a box….perhaps not one that huge! The tart looks delicious and I agree that the world is a strange one. And small. Oh gosh my mouth is watering… YUM! Oh, what an interesting recipe! We will probably get our share of radicchio from our CSA in the coming weeks, so I will keep this in mind! Pretty photos! I think the weirdest part is where you see both the UPS guy and Jill again in the same place. Weird. 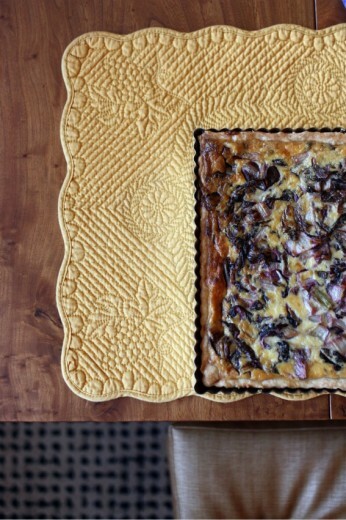 Love this use of radicchio! I’ve never seen it in a tart before. YUM. Just bought my first radicchio and may have to try this!